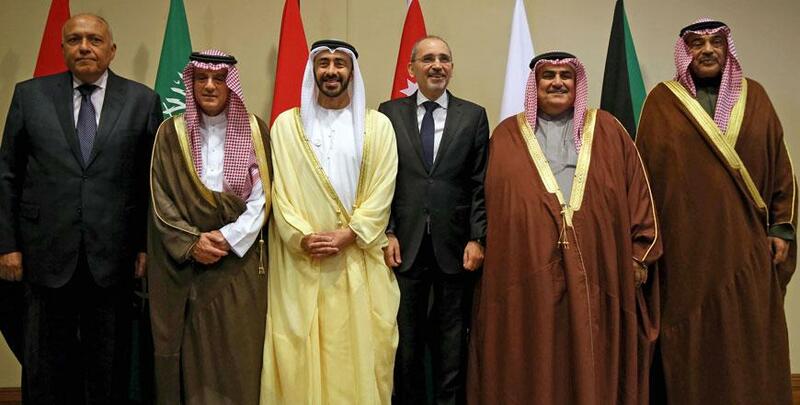 AMMAN — The foreign ministers of Jordan, Saudi Arabia, Bahrain, the UAE, Egypt and Kuwait on Thursday concluded a consultative meeting at the King Hussein Bin Talal Convention Centre near the Dead Sea. Minister of Foreign Affairs and Expatriates Ayman Safadi said that the ministers exchanged views on regional issues and developments, and means to overcome crises and achieve security and stability in the Arab world, a Foreign Ministry statement said. Safadi noted that Thursday’s meeting consisted of an open discussion with no specific agenda, and that it was mainly focused on achieving common Arab interests. He added that the meeting witnessed consensus among all parties on means of jointly addressing several regional issues, according to the statement. The talks brought together the UAE’s Minister of Foreign Affairs and International Cooperation Sheikh Abdullah Bin Zayed Al Nahyan, Kuwait’s First Deputy Prime Minister and Foreign Minister Sheikh Sabah Al Khalid Al Hamad Al Sabah, Bahrain’s Foreign Minister Khalid Bin Ahmed Al Khalifa, Egypt’s Minister of Foreign Affairs Sameh Shoukry and Saudi Arabia’s Minister of State for Foreign Affairs Adel Al Jubeir. Foreign Ministry Spokesperson Sufian Qudah said that the meeting was “positive and constructive”, adding that it encompassed an expanded discussion about regional developments, enhancing cooperation and ways of addressing common challenges. His Majesty King Abdullah met with the Arab top diplomats a day earlier at Al Husseiniya Palace, and highlighted the need for joint coordination on regional issues and crises to serve the interests of Arab countries and peoples, expressing hope that the meeting would bear successful results.